Greer Creek Falls Hiking Trail in Vanderhoof, British Columbia, Canada is a wilderness hike leading to an 8 metre waterfall in the remote backcountry wilderness forest regions near the community. 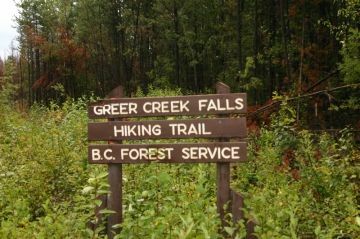 The Greer Falls Hiking Trail follows a well maintained, pine needled cushioned path for approximately 1.2 kilometre one-way to a waterfall and picnic site. The trail is an easy grade, level route suitable for most ages. The entire route - there and back - should take no longer than 1.5 hours to complete. Once at the base of the falls explorers may continue hiking to the top of the waterfall via a connector trail or explorers may decide to explore along the shores of Greer Creek. The area is a prime region to be one with nature - no crowds, no noise - and enjoy the peace and tranquility of the region with no interruptions. 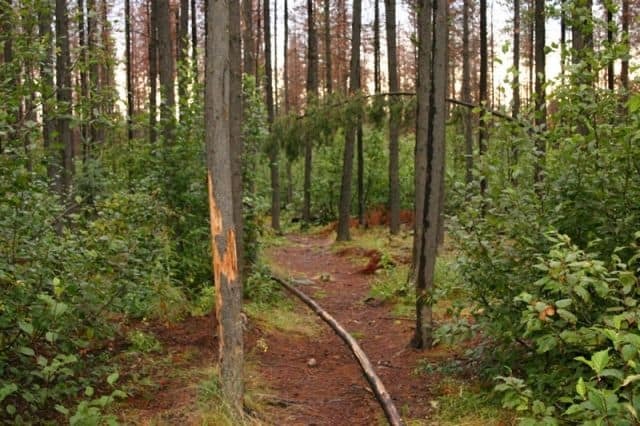 The hiking trail, although in good shape, has some exposed tree roots and rocks and in the shoulder seasons it can sometimes can get muddy and slippery and should be explored with caution. Please stay away from the edge of the falls and rock bluffs. At the end of the path, there is a picnic area with a picnic table. The wilderness region is also home to some wildlife like Moose and Black Bears. It is wise to hike in groups and to not feed the animals... pictures are always encouraged from a distance. Continue further down Kluskus FSR (the main gravel road) and there is another wilderness trail, albeit allot longer, that leads to a ranger cabin for overnight accommodations and some lakes. The trail is called the Home Lake Hiking Trail. From Hwy 16 in the centre of Vanderhoof, BC, Canada turn onto the Kenney Dam Road and begin traveling west. The paved road will past Sai'kuz First Nation Village and follow the shores of Nulki Lake eventually turning into a gravel road. At the main intersection of the Kenney Dam, Kluskus and the Telegraph Forest Service Roads (FSR) turn onto Kluskus and continue to follow the signs. At about the 37 km point (21 mi.) the small gravel parking lot on the right will appear. There is a large Trail Marker sign on the side of the road. Park and hike.